Children’s Liturgy is celebrated on Sunday mornings, during the 11:00 Mass. It delivers the same readings but in easier to understand words. We do not give a sermon, however the children are asked to share what they heard. This is designed for children age 6-10; younger children are welcome when accompanied by an older sibling. 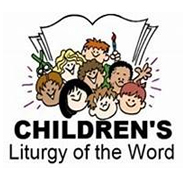 If you are interested in helping with children’s liturgy of the word or would like more information please call the parish office at (330)425-8141.